A total of one hundred infant milk powder samples were collected from different pharmacies in Kafrelsheikh Governorate for bacteriological examination. The obtained results revealed that B. cereus was detected in 19% and 11% (sporulated form) of the examined samples with average counts of 1.2 × 102 ± 5.2 × 102 and 4.0 × 102 ± 1.4 × 102 cfu/g, respectively. Subsequently, PCR assay to identify 2 virulent genes in 30 of the isolated strains was applied. The PCR targets selected were the hblc gene using FHBLC (F) and FHBLC (R) primers, and cytK gene using FCytK (F) and FR2ytK (R) primers. Eight (42%) of vegetative B. cereus isolates had hblC gene, and 3 isolates had cytK gene, while 7 isolates had both genes. Of the eleven B. cereus spore strains, 4 isolates had hblC gene, 2 had cytK gene and 2 had both genes. Additionally, E. sakazakii could be isolated from 3% of the examined samples, while salmonellae failed to be detected in any of the examined samples. Furthermore, 4 strains, one carrying hblC gene, one carrying cytK gene, one carrying both genes and one do not carry any of the genes were experimentally inoculated into reconstituted milk powder at concentration raged from 5 × 10 to 1.6 × 102 cfu/ml. The inoculated milk samples were incubated at 25ºC and examined for B. cereus count each 2 h up to 6 h storage. There was a remarkable increase of B. cereus organism's count without significance difference between the B. cereus inoculated genes. The results concluded that infant milk powder in spite of its low moisture content may at times suitable for supporting the growth of these organisms and subsequently be responsible for food poisoning to infants. The public health importance of the isolated microorganisms was discussed. Infant milk powder, B. cereus, Enterotoxins, E. sakazakii, Salmonellae. Powdered Infant formula (PIF) has been used to feed millions of infants for years, and it constitutes the majority of infant formula worldwide. This product is formulated to mimic the nutritional profile of human breast milk. As PIF is not a sterile product, it is an excellent medium to support bacterial growth may be contaminated with pathogenic microbes that can cause serious illness in infants . It has not possible by current technology to produce PIF that were devoid of low levels of microorganisms. Post processing contamination is a major factor impacting on contamination of milk powders, as the raw material is often subjected to lethal temperatures, which eliminate vegetative cells of pathogens. Milk powder outbreaks demonstrate that failure in preventive systems such as presence of water which allow microbial multiplication, or presence of zones difficult to maintain and to clean is the origin of contamination . B. cereus was among the primary microorganisms associated with PIF contamination as reported by FAO/WHO Expert Consultations  and Low numbers of B. cereus present in infant formula are due to contamination of raw milk from the environment . B. cereus has been reported to produce 5 enterotoxins and 1 emetic toxin, of them, heamolysine BL (HBL) and non heamolytic enterotoxin (Nhe) which consists of 3 different exo-proteins while the other toxins, Ent FM, cyt K and Bce T which consist of a single protein . In 2004, an expert meeting convened by the Food and Agriculture Organization of the United Nations and the World Health Organization concluded that the microorganisms of greatest concern in PIF are Salmonella enterica and Enterobacter sakazakii . Powdered milk formula is important source of E. sakazakii infection. This bacterium is resistance to drying and acid pH, heat, biofilm formation and persistence on food preparation surfaces and new-born infections of E. sakazakii were associated with infant formula and milk powder . Low–level contamination of powdered infant milk formula with salmonellae has been associated with infection in infant . To the best of our knowledge, there is a little data pertaining to the ecology and virulence in a variety of B. cereus detected in infant milk powder in Kafrelsheikh governorate, Egypt. Therefore, the objective of this study is to determine the prevalence of B. cereus (vegetative and spore former), E. sakazakii and Salmonellae and detection of enterotoxin production genes of B. cereus (hblc & cytk) in infant milk powder and to study the effect of storage time on the growth of B. cereus in reconstituted infant milk powder stored at room temperature to guarantee safe consumption of infant milk powder. This study was carried out with one hundred random samples of infant milk powder collected from local different pharmacies in Kafrelshiekh Governorate, Egypt during the period from January to July 2015. Samples were transferred to the laboratory in their packages to be examined bacteriologically. Each infant milk powder packages was mixed well before being aseptically opened. 11 g of well mixed milk powder were transferred to 89 ml of sterile 0.1% peptone water (40ºC-45ºC) using a dry and sterile metal spatula to give a dilution of 1:10 and then ten-fold serial dilutions were prepared. Enumeration (MPN/g), isolation and identification of spore former B. cereus: This was performed according to Polish standard PN - EN ISO 21871 . Growth - positive tubes (turbid) were sub-cultured on PEMPA medium (Oxoid), the plates were incubated at 30ºC for 48 h. The total count of B. cereus group spores in 1 g of infant milk powder was determined by the MPN (Most Probable Number) method. Biochemical identification of the isolated organisms was done according to Koneman et al. . Detection of hblC & cytK genes of the isolated strains of vegetative and spore former B. cereus by using PCR technique: Application of PCR for identification of heamolysin BL (hblC) and cytotoxic K (cytK) genes of B. cereus was performed essentially by using Primers (Pharmacia Biotech) as shown in Table 1. Table 1. Identification of hblC & cytK genes of B.cereus was performed using primers. Isolation and identification of E. sakazakii: according to FDA . Isolation and identification of Salmonellae: according to FDA . Bacterial stock culture: B. cereus strain was cultured in 10 ml of sterile Tryptic Soy Broth (TSB). The broth is incubated at 37°C for 24 h and then centrifuged at 3000 rpm. The supernatant is removed and the remaining cells are re-suspended in sterile dist. water. Serial dilutions were prepared from each stock tube and 100 ul from each tube were spread on previously prepared PEMPA plates. The plates were incubated at 35ºC for 24 h. and the colonies forming unit/ml were calculated. Experimental inoculation: 1000 ml of reconstituted milk powder were added into five sterile flasks (200 ml each). The flasks were inoculated with B. cereus –ve hblC & cytK, B. cereus +ve hblC, B. cereus +ve cytK and B. cereus +ve hblC & cytK, each strain in each flask. The flasks were efficiently corked, incubated at 25°C and examined each 2 h until 6 h of storage for B. cereus count. Table 2. Statistical analytical results of Bacillus cereus count (vegetative form) in the examined infant milk powder samples on PEMBA agar media. Table 3. Statistical analytical results of Bacillus cereus (spore former) count by MPN/g in the examined infant milk powder samples. Table 4. Detection of enterotoxin genes (hblC and cytK) in Bacillus cereus (vegetative form) isolates from examined infant milk powder samples. 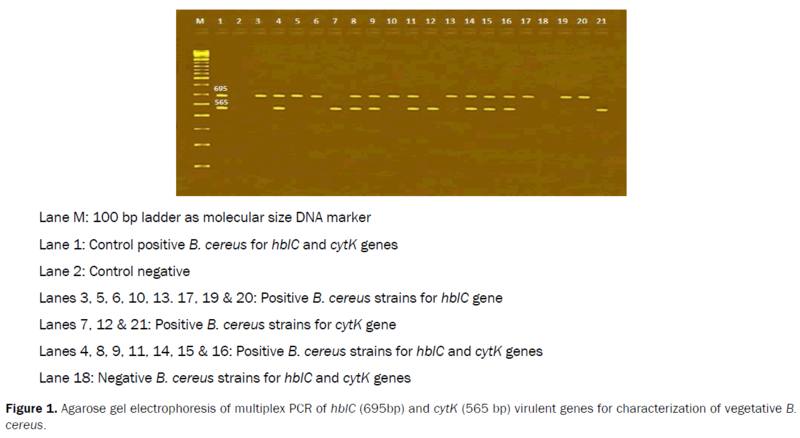 Figure 1: Agarose gel electrophoresis of multiplex PCR of hblC (695bp) and cytK (565 bp) virulent genes for characterization of vegetative B. cereus. Table 5. Detection of enterotoxin genes (hblC and cytK) in B. cereus (spore former) isolates from examined infant milk powder samples. Figure 2: Agarose gel electrophoresis of multiplex PCR of hblC (695bp) and cytK (565 bp) virulent genes for characterization of sporulated B. cereus. Table 6. Incidence of E. sakazakii in the examined infant milk powder samples on VRBG media. E.sakazakii 97 97 3 3 Absent in 10 g sample. Table 7. Comparison of the isolated pathogens from infant milk powder samples with FDA  and CAC  standards (n=100). Table 8. Incidence of Salmonella in examined infant milk powder samples (n=100). N.B. % of increase was calculated from zero time counts. Table 9. Effect of storage at room temperature (25°C-30°C) on the growth of B. cereus having certain virulent genes in reconstituted milk. B. cereus is classified as category C or low risk, its prevalence in infant formula is sufficiently high to cause food borne infection outbreaks .The enterotoxin (diarrhoeal syndrome) of B. cereus poisoning is caused by ingestion of large number of cells and the subsequent production of the toxin in the small intestine. However the emetic syndrome of B. cereus food poisoning occurs after the ingestion of food in which the organism has grown and formed its toxins . Results presented in the Table 2 shows that 19% of examined infant milk powder samples were positive for B. cereus with counts ranged from 1 × 10 to 9 × 102 and a mean value of 1.2 × 102 ± 5.2 × 10 cfu/ml reconstituted milk. These results agree nearly to results obtained by Azza et al. , Wong et al. while higher results were reported by Sameer et al. and Angela et al. . Results in Table 3 declare that the B. cereus spores were detected in 11% of examined infant milk powder samples with counts ranged from 2.3 × 10 to 1.1 × 103 and a mean value of 4.0 × 102 ± 1.4 × 102 spores/ml. These results agree with results obtained by Aman et al. , Reyes et al. and Juan et al. . According to FDA (1996) standard which stipulate that B. cereus must be less than and or equal 100/g , so it is clear that 21% and 64% of infant milk powder samples failed to comply the standard limit regarding counts of vegetative and spore formers respectively. Dried milk products are known to be frequently contaminated with B. cereus spores . The infectious dose for B. cereus may vary from about 1 × 105 to 1 × 108 viable cells or spores/g. Generally presence of B. cereus greater than 106 organisms/g in the food is indicative of growth and proliferation of the organisms and considers a potential hazard to health . Fernandes et al. found that about 40% of B. cereus strains harbor the hblc genes responsible for the HBL codification while Lund et al. recorded an outbreak of a strain expressing the cytk toxin produced severe symptoms with bloody diarrhea. The primers designed by Ngamwongsatit et al. were used under specific multiplex PCR conditions for detection of enterotoxin genes (hblc and cytk) in selected strains. DNA band visualized by ethidium bromide in agarose gel at the expected molecular size for hblc and cytk genes at 695 bp and 565 bp respectively were detected. Nineteen B. cereus vegetative strains isolated from infant milk powder samples were analyzed for the pressence of hblc and cytk genes as in Table 4 using the PCR primers listed in Figure 1, hblc genes was detected in only in 8 isolates (42.1%), cytk genes only was in 3 isolates (15.8%), hblc and cytk genes was in 7 isolates (36.8%) and hblc and cytk genes was not detected in one (5.2%) isolate. Moreover, 11 sporulated B. cereus spore strains isolated were analyzed for the presence of hblc and cytk genes using the PCR primers listed in Figure 2, hblc gene was detected in 4 isolates (36.4%), cytk gene was detected in 2 isolates (18.2%), hblc & cytk genes was detected in 2 isolates (18.2%) and both hblc and cytk genes failed to be detected in 3 isolates (27.3%) (Table 5). Angela et al. ; Ji-Yeon and Jong-Hyun ; Arsalan et al. ; Hussein  and Chon et al. could detect both hblc and cytk genes, at varying percentages ranged from 20 to 77% of screened isolates. The results summarized in Table 6 show that 3% of examined infant milk powder samples were contaminated with Gram - negative E. sakazakii. Our findings are consistent with Heuvelink et al. while higher findings were obtained by Aigbekaen et al. . On the other hand El-Sharoud et al. failed to detect E. sakazakii in any samples examined. According to CAC  standard which sets a limit of absence of E. sakazakii in 10 g of infant milk powder, so it is clear that 3% of infant milk powder samples failed to comply the standard limit (Table 7). Infant formula and milk powder have been the most common vehicles implicated in neonatal E. sakazakii infections . Historically, Enterobacter have been implicated in newborn and infant infections, causing meningitis, necrotizing enterocolitis (NEC) and bacteremia or sepsis . Salmonella organisms failed to be detected in all of examined infant milk powder samples (Table 8). These findings were nearly similar to results obtained by Matug et al. , and agree with the European and Egyptian, FDA  standards which stipulated a limit of zero salmonella in 25 g of dry milk products . On the other hands Zagare et al. could detect salmonellae in infant milk powder. Results in Table 9 reveal that the survival characteristics of B. cereus carrying hblc gene, cytk gene and both hblc & cytk genes in reconstituted milk powder stored at 25°C for 6 h. All batches were examined each 2 h. A steady increase in cfu/ml reconstituted milk was clearly observed but without significant difference between the growth characters of different B. cereus carrying genes inoculated and reached the infectious dose in less than 6 hours. The results which slightly agree with the Food Standard Australian New Zealand  who stated that formula prepared with initial levels of 100 cfu B. cereus/g may reach infectious dose when stored at room temperature for greater than 4 h. Therefore, FDA, FAO/WHO and CDC forcefully advocate the mother- feed over bottle feed to avoid the possible life threatening illness to neonates and infants caused by microbial contamination and reduce the delay between preparation and consumption of infant milk powder. This study indicated high incidence of toxigenic B. cereus strains and E. sakazakii in infant milk powder sold in Kafrelsheikh governorate and a possible high risk of food borne infections especially for infants. Therefore, special attention should be given to the importance of including B. cereus and E. sakazakii in disease control and prevention programs in Egypt that may constitute a public health hazard. Multiplex PCR is considered as an alternative method for rapid identification of B. cereus in milk products. Breeuwer P, et al.Desiccation and heat tolerance of Enterobactersakazakii. Journal of Applied Microbiology.2003;95:967-973. ICMSF. Microorganisms in Foods. 6 Microbial Ecology of Food Commodities, Blackie Academic and Professional, London, UK;1998. Wang M, et al. Detection of Enterobactersakazakii and other pathogens associated with infant formula powder by use of DNA micro array. Journal of clinical microbiology.2009;47:3178-3184. Food standards Australia New Zealand.Bacillus cereus limits in infant formula. Final Assessment Report, Application.2004;454:1-04. Hansen BM,et al. The Bacillus cereusbceT enterotoxin sequence appraised. FEMS MicrobiolLett. 2003;223:21-24. FAO/WHO.Enterobactersakazakii and Salmonella in Powdered Infant Formula (Meeting Report). Microbiological Risk Assessment Series 10. Rome: Food and Agriculture Organization of the United Nations/World Health Organization.2006. Iversen C and Forsythe SJ. Risk profile of Enterobactersakazakii, an emergent pathogen associated with infant milk formula. Trends in Food Science and Technology. 2003;14:443-454. Bornemann R, et al. An outbreak of Salmonella serotype saintpaul in achildren’s hospital. Infect Control HospEpidemiol.2002;23:671-676. APHA. American public health association.Standard Methods for Examination of Dairy products, 16th Ed, American public Health Association, Washington DC, USA; 1992. Holbrook R and Anderson JM. An improved selective and diagnostic medium for the isolation and enumeration of Bacillus cereus in food. Candian JMicrobiol. 1980;26:753-759. Polish Standard PN-EN ISO 21871. Microbiology of food and feedstuffs. Horizontal method of determination of low numbers of presumptive Bacillus cereus. Detection and determination of most probable number.2007. Koneman E, et al. Color atlas and Text book of Diagnostic Microbiolog. 4th ed. L.B Lippincott Company, Philadelphia, USA.1992. Ngamwongsatit P,et al.Broad distribution of entertoxin genes (hblCDA, nheABC, cytK, and entFM) among Bacillus thuringiensis and Bacillus cereus as shown by novel primers. Inter J Food Microbial. 2008;121:352-356. FDA. Food and Drug Administration. Isolation and enumeration of Enterobactersakazakii from dehydrated powdered infant formula. 2002. FDA. Food and Drug Administration. Center for Food Safety& Applied Nutrition. Bacteriological Analytical Manual Online, 8th ed. Ch. 14: Bacillus cereus, Rhodehamel and Harmon.2006. FDA. Food and Drug Administration. Microbiological standards for infant formula proposed in 1996 ANPR.1996. CAC. Codex Alimentarius Commission. Report of the Thirty- first Session of the Codex Alimentarius Commission. Geneva, Switzerland.2008. Animal and Plant Quarantine Agency. Microbial criteria for livestock products.2013. ICMSF. International Commission on Microbiological specification for Foods.Micro-organisms in Foods 5. Characterization of Microbial Pathogens. International Commission on Microbiological specifications for Foods. Blackie Academic and Professional, London UK.1996. Azza MMD,et al. Bacteriological investigation on milk powder in the Egyptian market with emphasis on its safety. Global Veterinarian.2010;4:424-433. Wong HC,et al. Incidence and characterization of Bacillus cereus isolates contaminating dairy products. Applied and Environmental Microbiology.2015;54:699-702. Sameer RO,et al. Occurrence and characterization of toxigenic Bacillus cereus in food and infant feces. Asian pacific Journal of Tropical Biomedicine. 2015;5:515-520. Angela DP,et al. Occurrence of potentially enterotoxigenicBacillus cereus in infant milk powder. European Food Research and Technology.2013;237:275-279. Aman IM,et al. Bacillus cereus: its incidence in some Egyptian dairy products and its sensitivity towards nisin in reconstituted milk powder.World Congress Foodborne Infections and Intoxication.1998;2:971-977. Reyes JE,et al. Prevalence of Bacillus cereus in dried milk products used by Chilean School Feeding Program. Food Microbiol.2007;24:1-6. Becker H,et al. Bacillus cereus in infant foods and driedmilk products. Int. J. Food Microbiol. 1994;23:1-15. Notermans S and Batt CA. A risk assessment approach for Food-borne Bacillus cereus and its toxins. J ApplMicrobiol. 1998;84:51-61. Fernandes MDS,et al. Enterotoxigenic profile, antimicrobial susceptability, and biofilm formation ofBacillus cereus isolated from ricotta processing. International Dairy Journals.2014;38:16-23. Lund T,et al. A new cytotoxin from B.cereus that may cause necrotic enteritis. Molecular Microbiol. 2000;38:254-261. Ji-Yeon H and Jong-Hyun P. Characteristics of enterotoxin distribution, heamolysin, lecithinase and starch hydrolysis of B. cereus isolated from infant formulas and ready- to eat food. J Dairy Sci.2014;98:1652-1660. Arslan S,et al. Toxigenic genes, spoilage potential and antimicrobial resistance of Bacillus cereus group strains from ice cream. Aneorobe.2014;25:42-46. Hussein MS. Molecular characterization of Bacillus cereus isolated from milk and milk products. MVSc thesis submitted to Kafreslsheikh University, Kafrelsheikh. Egypt.2015. ChonJW,et al. Toxin profile, antibiotic resistance, and phenotypic and molecular characterization of Bacillus cereus in sunsilk. Food Microbiol.2012;32:217-222. Heuvelink AE,et al. Enterobactersakazakii in Milkpowder. Project number OT 0110, Keuringsdients van WarenOost, 2001. Aigbekaen BO and Oshoma CE. Isolation of Enterbactersakazakii from powdered foods locally consumed in Nigeria. Pakistan Journal of Nutrition.2010;9:659-663. El-Sharoud WM, et al.Characterization of Cronobacter recovered from dried milk and related products. BMC Microbiol.2008;127:129-138. Gökmen M,et al. Presence of Enterobactersakazakii in milk powder, whey powder and white cheese produced in Knoya. Kafkas Univ. Vet FakDerg.2010;16:163-166. Healy B,et al. Cronobacter (Enterobactersakazakii) an opportunistic foodborne pathogen. Foodborne Pathogens and Disease. 2010;7:339-350. Matug SM,et al. Microbiological examination of infant food and feed formula. Emer Life Sci Res. 2015;1:46-51. Food standards Australia New Zealand. A risk profile ofDairy products in Australia. Draft Assessment Report, proposal p 296, Primary Production and processing standards for Dairy. 2006. Zagare MS,et al. Analysis of dairy pack food for presence of bacterial pathogens. International J of Sci.2012;1:1.